My box has both happy and sad memories of mine. may seem nice on the outside but inside it’s a different story. It is dark but it is a wonderful world for me. The star is who I want to remember. 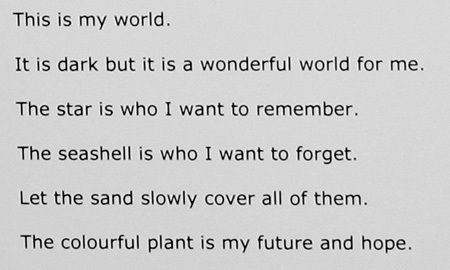 The seashell is who I want to forget. Let the sand slowly cover all of them. The colourful plant is my future and hope. For the project What It Means To Me I worked with a group of women fleeing domestic violence and currently living in a women's refuge in Ealing. Issues of anonymity were paramount as was creating an environment of trust in which the women felt able and confident to express themselves. 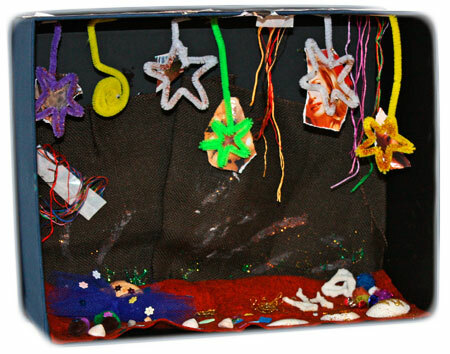 Many had no previous experience of art projects and others simply no longer had the time. We first discussed the idea of the 'hope chest' or 'bottom drawer'. The women were then asked to fill and decorate their own treasure box with things from their past and present that they would like to take with them into their future. They also added in their hopes and dreams for themselves and their children. For some, the project renewed an interest in art; for others, it was a challenging but therapeutic process. All the participants valued the opportunity to take part in an activity aimed at them, rather than their children, which also gave them time to socialise and reflect on their lives. It was a welcome break from the usual emphasis on practical concerns for the future. The boxes were displayed in the gallery alongside the main exhibition, Bottom Drawers, in which a number of artists and designers considered the 'things' they live with and that ultimately define their homes through their emotional attachment to them rather than their actual value or worth. 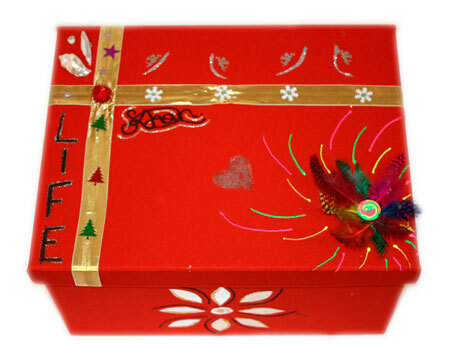 I made a box it was a wonderful and fun experience which I enjoyed. I have run a variety of workshops using the current exhibition, house or park as a stimulus. These have included Photographic Sequences, Simple Movign Images and Scary Pop-Up cards. The workshops are usually 2 hours in duration and aimed at children 6-9 and 10-12 years. The PM Gallery are also keen to work with local groups and together we devised workshops specifically targeting the Polish community on the theme of food and culture linked to the Anthony Key exhibition Dumplings and Other Stories and funded by Skills for Life.